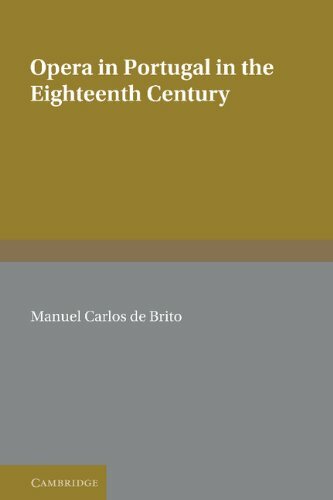 A detailed documentary history of opera in Portugal from the beginning of the eighteenth century to the inauguration of the still existing Teatro de S. Carlos in 1793. This 1989 study shows how the introduction of opera into the country at the beginning of the century was connected with the recruitment of Italian singers and players during the reign of Joao V, even though the court's interest in opera was small and the activity of public opera houses was hampered by the church and the King himself. This study is valuable not only as a much-needed authoritative and thorough history of the Portuguese musical theatre in the eighteenth century, paralleling existing studies for all other major European operatic centres of the time, but also for the significant contribution it makes to the study of Italian opera with which it interconnects, and of musical theatre in general. A detailed documentary history of opera in Portugal from the beginning of the eighteenth century to the inauguration of the still existing Teatro de S. Carlos in 1793. This book was first published in 1989.